I have been working on setting our table for Easter and fluffing a few things around the house for the holiday weekend. I pulled some fabulous plates out and set them up along with my favorite candles, some roses, some amazing blue and white eggs and all of my Staffordshire. It will be fabulous but most important it will be a buzz with all of us plus some family to celebrate the resurrection of our Lord. I can't wait, I love a full house and a table set with loved ones and giggles! My favorite Easter table is my inspiration this year. I have loved this table from the darling Chez V for a few years and every single time I see it I fall a little more in love. Do you see what I mean? Her choice for tablecloth always blows me away and those monogram napkins make me weak in the knees. 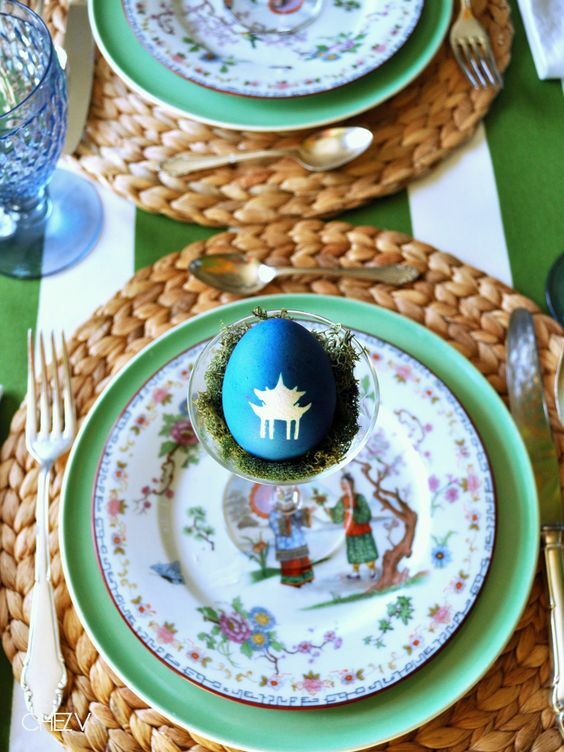 I love that she always uses moss at Easter and I will be using the same on our table. Thank you for the amazing idea!! And don't even get me started on the year she dyed Chinoiserie eggs. She is beyond talented and such a giver. I adore Emily. Emily inspires me to continue to set a full table, to stretch myself to mix and match what I have and constantly look for unique pieces. We have such similar taste, if we were neighbors we would have the best stash to pull from. These plates are the best! You must follow along with all the Chez V adventures and tablescapes with Emily's Instagram. She is so good about stopping for a moment and sharing her incredible eye. You will be inspired, pinky swear!